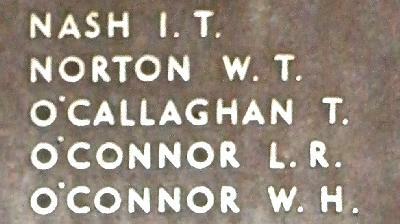 War Grave Register notes: O'CALLAGHAN, Tpr. Thomas, 2477. 2nd Australian Light Horse. Killed in action 4th Aug., 1916. Son of Ellen O'Callaghan, of Doctor's Hill, Kingwilliamstown, Co. Cork, Ireland, and the late Cornelius O'Callaghan. B. 41. Other details from Roll of Honour Circular "Had a hard life, sent out to 'service' to earn more, to help support a very big dad, at the early age of 10 and 11 years." (Information supplied by mother). Family/military connections Brother: 474 Pte Michael O'CALLAGHAN, 15th Bn, killed in action, 8 August 1915. Miscellaneous details Note difference in details re father: Embarkation Roll states father to be Thomas O'CALLAGHAN; OWG File gives father as the late Cornelius O'CALLAGHAN.